Golfers are always trying to find ways to increase their club head speed. The golf manufacturers would like you to believe that if you simply buy a new driver all of a sudden you're going to start swinging the golf club a lot faster. However, to increase your club head speed, you must actually work on the mechanics of your golf swing. No new driver is actually going to help you swing any faster. When it comes to increasing your swing speed, these are all of the choices you have to work with. Most golfers, I see trying to increase their swing speed focus primarily on rotation. That's because the pundits on TV will have you believe that if you simply spin your shoulders as fast as you can or rotate your hips as fast as you can you're going to swing the club head faster. However, I have proved time and time again that is not true. In fact rotating faster actually tends to have the opposite effect on club head speed. That's because you create centripetal force too early in the golf swing. The result of centripetal force is centrifugal force. Centrifugal force actually causes you to throw the club head away and lose lag. Which brings us to our primary source of club head speed, leverage. Leverage can be thought of in many different ways as it applies to the golf swing. To keep things simple, you should think of your primary source of leverage being the angle between your forearm and club shaft that is made at the wrist joint. This little angle makes up more than two thirds of your club head speed. That's right, 66% of your club head speed comes from the release of your wrist angle. So if you're looking for sources to increase your club head speed, you might want to start looking at your wrist angle first! As you will learn in these videos, the release is truly a passive motion in the Rotary Golf Swing. You don't really have to do anything in order to get the golf club to release properly as long as you are following the RotarySwing fundamentals. The golf club will actually release for you at the right time without you having to try and time it. This is another critical aspect of not only the Rotary Golf Swing, but how to increase swing speed in general. You don't want to be trying to time the release of the golf club by actively using your hands. The precise timing required for a proper release is impossible for the human brain to time consistently. You no doubt know this because you struggled with golf your entire life by trying to overuser your hands like most amateur golfers! So we know that if we want to increase our club head speed that we need more leverage in the golf swing but leverage by itself isn't the only aspect that we need to focus on. The other primary source of club head speed is width. Now, to some degree, width is taken care of for you. As you grab a longer golf club, the width of the radius of your golf swing increases by default simply because the shaft is longer. This creates more width in your golf swing, which adds speed. In fact, for every half-inch of shaft length that you increase on your club you pick up about 2 mph of club head speed. That's why you're pitching wedge will never be able to be swung as fast as your driver matter how hard you try. Once again RotarySwing proves that physics cannot be denied in the golf swing! However, just by increasing the shaft length of your club is not going to necessarily make you a great ball striker. There is a point of diminishing returns with the driver. At some point, as the shaft gets too long it becomes very difficult to control. So hitting the golf ball long ways into the woods doesn't really help us with our objective of hitting the golf ball over 300 yards. Not to mention that the driver will become unwieldy because of the weight of the club head. It is not designed to be swung on a 50 inch shaft. So, I want to help you think of width in the golf swing a slightly different way. When you think of width, I want you to think about making a wide backswing. Now, what good is a wide backswing going to do since weo bviously don't the golf ball until the downswing? One of the key factors of increasing your swing speed is recruiting enough muscle fibers to help you swing the club fast. While you don't need to be a bodybuilder to hit the golf ball long ways, you do need to recruit enough muscle fiber to help you generate enough horsepower to move the golf club fast enough to hit the ball 300 yards. How much muscle fiber? It takes about 32 pounds of muscle to generate 100 mph of club head speed. Most golfers simply don't have that kind of muscle mass available to them in their arms and shoulders. So, where do we recruit 32 pounds of muscle? Great question! We recruit that muscle mass by making a wide turn during the backswing by keeping the club and our arms very wide. By not folding your right arm early in the backswing like so many amateur golfers do, it will force your body to rotate more from the core in order to continue moving the club. As you rotate your body from the midsection in order to move the club rather than relying on your arms and hands, you are recruiting more muscle fiber than you normally would in your backswing. This is a big part of what I'm talking about when I say that I want you to use the big muscles in your body to swing the golf club. Not only will using these muscles help you swing the club head faster, but it will also help you sequence the downswing properly. The transition of the golf swing is really the crux of the golf swing for most amateur golfers. The reason they struggle to transition correctly is because they didn't wind up correctly during the backswing. 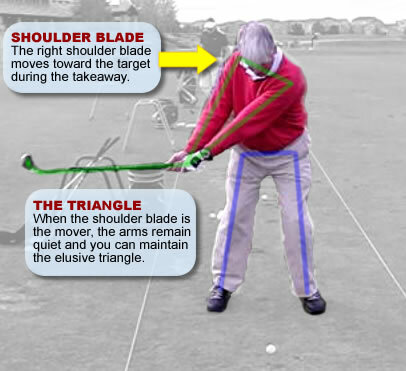 However by making a wide backswing by keeping your arms straight and not cocking your wrists early, it will force you to turn properly and this will help you automatically transition correctly during the downswing. 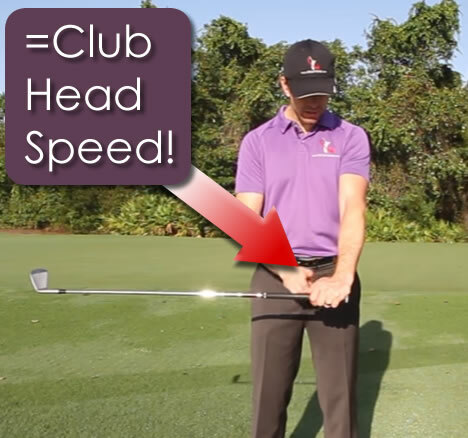 So if you want to increase your club head speed you really just learned how to do it. You need the proper amount of leverage, width and rotation in your golf swing. And as you continue to work on these fundamentals in these videos that I've given you you will increase your swing speed. Get Your Free Membership to Watch "3 Sources to Increase Your Golf Swing Speed" Right Now!